Leaf and spine traffic engineering using segment routing and SDN and CORD: Open-source spine-leaf Fabric describe a demonstration at the 2015 Open Networking Summit using the ONOS SDN controller and a physical network of 8 switches. This article will describe how to emulate a leaf and spine network using Mininet and configure the ONOS segment routing application to provide equal cost multi-path (ECMP) routing of flows across the fabric. 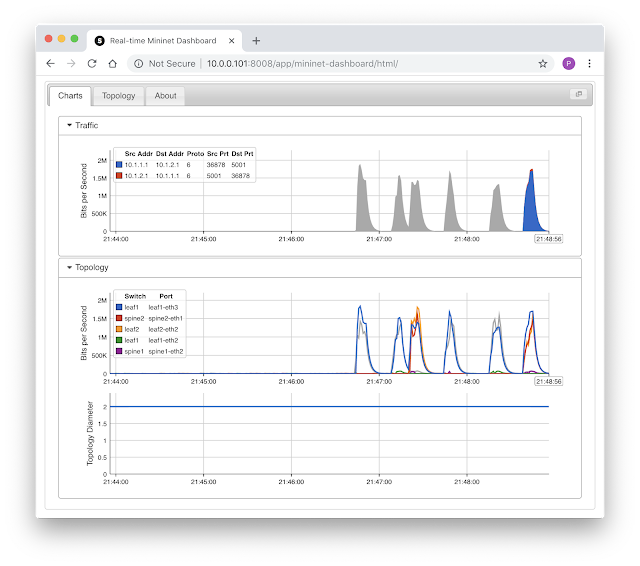 The Mininet Dashboard application running on the sFlow-RT real-time analytics platform is used to provide visibility into traffic flows across the emulated network. 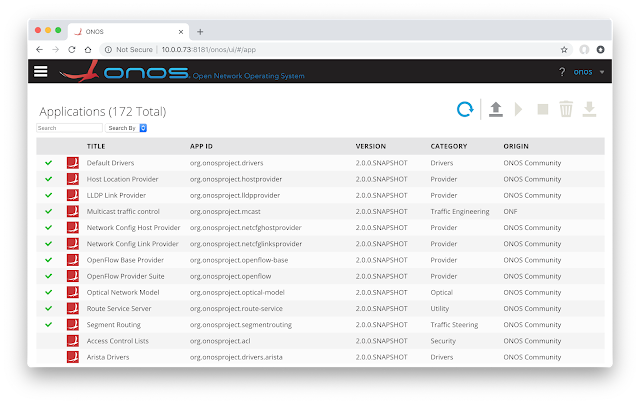 Use the graphical interface, http://onos:8181, to enable the OpenFlow Provider Suite, Network Config Host Provider, Network Config Link Provider, and Segment Routing applications. The screen shot above shows the resulting set of enabled services. 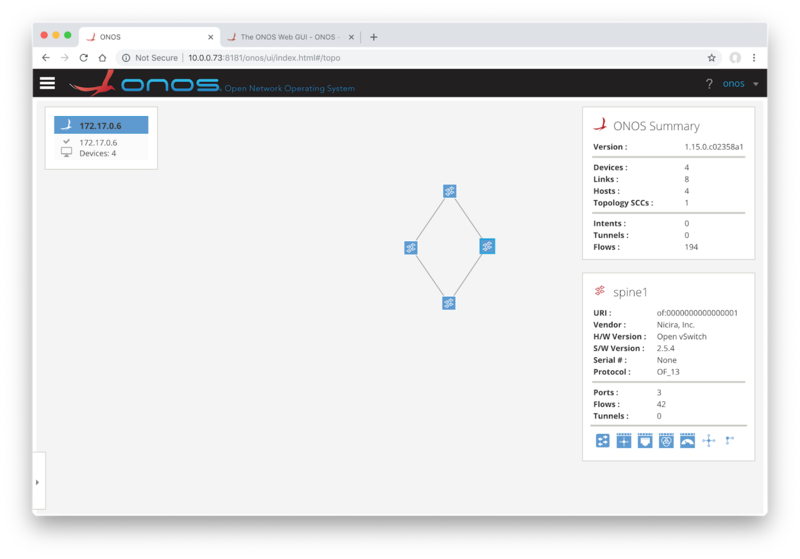 The sr.py script is used to create a leaf and spine topology in Mininet and send the network configuration to the ONOS controller. The sflow.py script enables sFlow monitoring of the switches and sends the network topology to sFlow-RT. The leaf and spine topology will appear in the ONOS web interface. In this case the traffic flowed between leaf1 and leaf2 via spine1. Since ONOS segment routing uses equal cost multi-path routing, subsequent iperf tests may take the alternative via spine2. Switch to the Charts tab to see traffic trend charts. In this case, the trend charts show the results of six iperf tests. The Traffic chart shows the top flows and the Topology charts show the busy links and the network diameter. See Writing Applications for an introduction to programming sFlow-RT's analytics engine. Mininet flow analytics provides a simple example of detecting large (elephant) flows. Thank you for your post. Can we amend the sr.py (to accommodate a custom topology) or use a custom script to work with onos controller and still use sFlow? ONOS traffic analytics and ONOS measurement based control provide additional examples of using Mininet with ONOS and sFlow / sFlow-RT. Segment routing requires quite a bit of configuration. 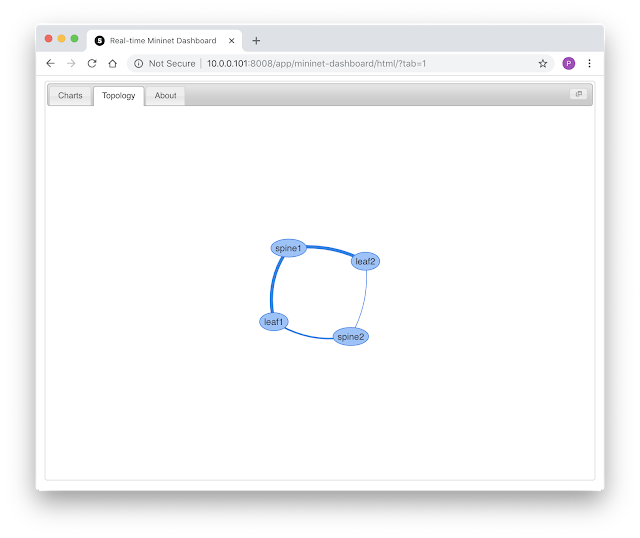 You could use the sr.py script as a basis for building your own custom topology. Enabling sFlow is independent of the topology script, just include the sflow-rt/extras/sflow.py script in the list of custom topologies to enable sFlow and push the Mininet topology to sFlow-RT (sFlow-RT must be running before you start Mininet).